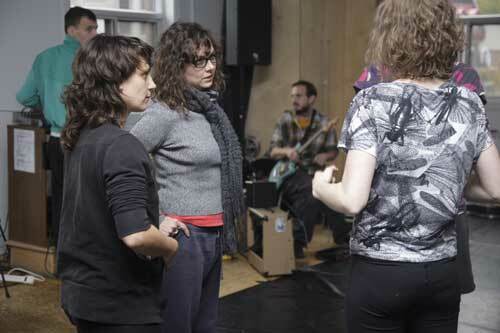 Ame Henderson lives and works in Toronto where she is the artistic director of Public Recordings. Her works Blue**Disco (2002), memories and statements (2004), Manual for Incidence (2005), /Dance/Songs/ (2006), Open Field Study (all together now) (Nuit Blanche, 2007) and It was a nice party (Dancemakers, 2008) have been presented in The Netherlands, Italy, Croatia and across Canada. 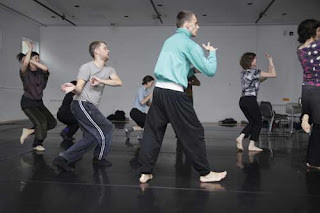 The Most Together We’ve Ever Been, a duet with Matija Ferlin, premiered in July 2009 at INK (Pula, Croatia), appeared at Tangente (Montréal) in October 2009 and at Dancemakers’ TWOBYTHREE - a festival of duets in February 2010. You say that you are paradoxically at times elated and also despondent with the way things are in the world. What particular issues draw your attention or emotion? Specifically, since we often tend to dwell on the negative, what makes you feel elated? It is so easy to become discouraged with the state of things in the world. The environment is under duress, we witness poverty and injustice, corruption and the seemingly unending hold of consumerism and individualism taken to such extremes they feel irreversible. I wonder about art and its ability to resist; I find myself questioning its relevance as a space for resistance and hopeful dissent. These are things that make it difficult to stay upbeat. And so, I try to focus on the small discoveries of an art practice that does not follow the rules of efficiency, that mostly remembers to take its time, that makes mistakes, and is often absurd and hilarious and tragic for these reasons. Together with others, I work on dances and performance situations for them, trying to believe that in some small way these attempts can make a space not so much away from but just beside all of the looming unknowns and fears of irrelevance. Sharing these processes with artists who are both my friends and my most trusted critics, I am often shaken by people’s generosity of spirit, by their ability to risk and to question, by their humility and humour. You note that you construct a laboratory in the studio that is “influenced by the accumulated histories, thoughts and strategies of a group of individuals”. I know that you spend a good deal of time in your process discussing ideas with your collaborators, sitting around a big table full of books and notes. So I can see that these influences come to bear through such conversations. Do you also feel that these influences show up in other non-verbal ways and if so, how? I’m interested in your perspectives and experiences of the intangible dynamics that percolate among a group in a creative process. Yes. We all arrive into these working situations as ourselves and bring to them all of our knowledge and experience, desires, blind spots. This diversity of perspective is embodied as much as it is theoretical or anecdotal. People have had different work experience, training and history of injury. In working together, these traces are brought to bear on what we make, contributing to the dynamics of exchange and complicity. For me, moving from distinct positions toward each other is as much a physical creative process as a theoretical one. Therefore the movement between spaces of exchange (the table, the studio, the theatre) is important, each space allowing us to articulate our positions and move toward each other in different ways. I’m interested in your thoughts about the ability of the body to reveal and transform societal structures. Several cultural theorists have taken up these considerations in various ways and I wonder if your thinking is informed by or in argument with any specific theoretical writing about the body? If so, who/what are you reading and how do you situate your work in relation to their ideas? These days, I am probably most influenced by recent writings by Deleuzian thinkers including Brian Massumi and Elizabeth Grosz as well as by political theorists Chantelle Mouffe and Julia Kristeva. My orientation toward the body and embodiment focusses on relationality and the processes of these exchanges as well as “the political” as a dynamic of relation. Quoting you from your artistic statement in the April print issue of The Dance Current: “In staging these events, I hope to make the act of performance a site to imagine different arrangements and realities.” With respect to your belief that the body can both reveal and transform societal structures, in your performances, do you think you/your performers are in the act of actually transforming structures or in the act of proposing or imagining the possibility of transformation? (I guess I’m asking about your perspective on what you call the “interface of the theatre” and thus what you aim for in terms of a relationship with the public? 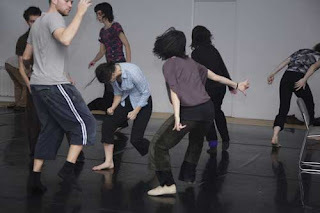 I think I am most concerned with creating spaces to hold a polyphony of perceptions - both for performers and audiences. I try to set up the circumstances where we can imagine, project, think or dream with and to the art object, the performance. By interface I mean both the apparatus that makes our work visible and also one that allows exchange between different perspectives - the viewer and the performer. I am not so sure about looking for something in particular, but only with noticing a space where something might happen. Your collaborative team involves not only dancers but also dancer/actors, a composer and a dramaturge. How do the perspectives of artists from other disciplines inform your work? What do you learn about dance by looking at other forms? Can you give a specific example? In a series of recent works (/Dance/Songs and It was a nice party) I have engaged with the codes of other mediums such as cinema and live music. I have found that this transduction has allowed me to address what is specific to dance, how it collides and departs with the rules of other forms. I feel similarly about the different perspectives brought by collaborators with backgrounds other than dance. We all have to decide together how the work belongs or relates to a dance tradition. In relay, and I think also in your duet with Matija Ferlin, The Most Together We’ve Ever Been, you are engaging with ideas of togetherness, individuality and the unison gesture. How did you arrive at this topical focus for your work? What politic underlies this concern/interest? I have been working collaboratively for many years, at first almost by accident and now as a crucial through line of my practice. The investigation of collaboration and the necessity of agreement and discord in a creative process as a working dynamic have increasingly seeped into the artistic and conceptual frameworks for my projects. I can no longer make such a clear distinction between the ways we work and the artworks that we produce, and so I think the recent projects are a result of my interest in questioning the practice of making in general. At the same time, I feel strongly that finding ways to meet each other and to begin to find space for the perceptions of the other are vital to our contemporary situation. I feel a responsibility to address these conundrums in my work - to work things out, to talk things out, to find new modes within my medium - thinking that this might help. Based on your response above, I wonder if there are utopic/idealistic threads underpinning your explorations of togetherness and whether through this work you are expressing a hopeful perspective? I think I have as many questions and scepticism about the possibility and danger of utopia as the next person. If there was such a thing, I would say that my work tries to ‘think utopically’, meaning that it privileges the space for possibility that things could get better, for hope (if you want to call it that) but situates this thinking as a dynamic that exists and is useful now - in real time, in the messy place we are actually in. In your statement in the print magazine, you comment on your interest in the “the role of the dancer in the emerging dance archive”. I wonder what you mean by this? Further, what specific questions are you interested in posing about authorship and legacy? I am curious about the ways that the body can be understood as a document while also being in the process of constantly documenting as it is also experiencing. Working with performers with histories of making and performing works, I’ve become increasing aware of the archival nature of memory - what the dancer remembers and how this is an often unrecognized site of a constantly emerging, shifting archive. In relay, the performance is structured as a mechanism that allows this embodied archive to become visible. Individual memories become a launching place for something shared. Relating this to other questions earlier in the interview, I would say that this work makes explicit the reality that none of us come from no place, that our perspectives and experience are consequent to the unfolding of the event. In this way, I hope that I am also positing questions about legacy and authorship. In choreography, unlike visual art, music and cinema for example, we don’t have a history of quoting, sampling and reconstruction practices - modes that I think both reconfirm and reconfigure the evolution of art practice. Ame Henderson/Public Recordings presents relay from April 7th through 10th as part of Harbourfront Centre’s World Stage at the Enwave Theatre, Toronto. 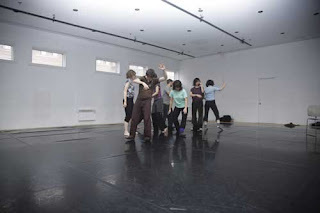 relaythen appears at the Canada Dance Festival on June 12th at the National Arts Centre, Ottawa. The work was co-commissioned by the CanDance Network, Rencontres chorégraphiques internationales de Seine-Saint-Denis, Harbourfront Centre, L’Agora de la danse, The Vancouver East Cultural Centre and Canada Dance Festival. | Ame Henderson/Public Recordings présente relay du 7 au 10 avril dans le cadre de la série World Stage du Harbourfront Centre au théâtre Enwave, Toronto. 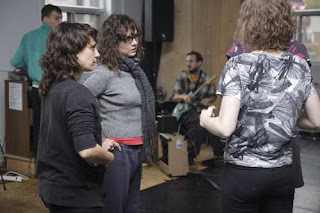 La pièce est ensuite présentée au Festival Danse Canada le 12 juin au Centre National des Arts, Ottawa. relay est une commande du Réseau CanDanse, de Rencontres chorégraphiques internationales de Seine-Saint-Denis, de Harbourfront Centre, de l’Agora de la danse, du Vancouver East Cultural Centre et du Festival Danse Canada.